What this Inspirational Life Quote teaches us? 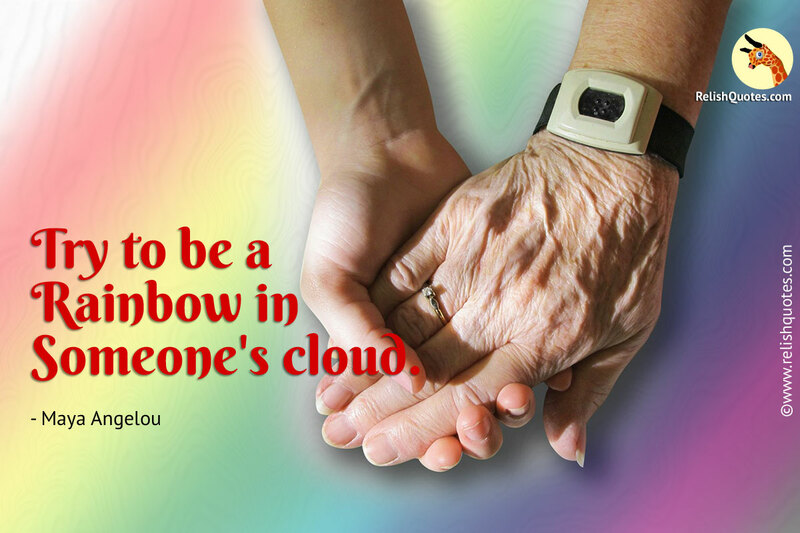 This Life Quote by Mary Angelou delivers to us, the most beautiful message of being a strong support to someone who you know is undergoing a difficult phase in life. We live in a world where we are so immersed in the happenings and events of our own life, that sometimes we forget that there are others too. Life is not a bed of roses every day. There comes a rough patch in everyone’s life, and not all have that immense courage of facing the bags of problems that life throws. In such times be a light in someone’s gloomy life. Have the heart a kind hearted human being and give every bit of yourself to aiding the person who is not seeing the best of phases in his life. Money, power, fame and worldly whims and fancies are some things that we will be running behind, till the last day of our lives. But if God, your hard work, and destiny have made you capable of helping others in your life, do it. Do not give a second thought, in helping someone when life is not good and circumstances are not that friendly. Do not forget the fact that, we all are bound by universal brotherhood and helping and backing someone during tough times becomes our responsibility. The feeling of satisfaction that you experience is absolutely fulfilling. The thought, that you have been a supporting shoulder to lean on, for someone who is facing trials and tough situations in life, is enriching for your soul. Remember the support system that you had when things in life were not going your way? The person, who is in trouble, is in the same place and exact situation where, at some time, you were. Carry a guiding light on someone’s path of darkness, be a listening ear, offer a shoulder to cry on, be an umbrella and a life jacket in and catch the person falling in troubles and bad times. Help without hesitation and receive blessings in abundance.